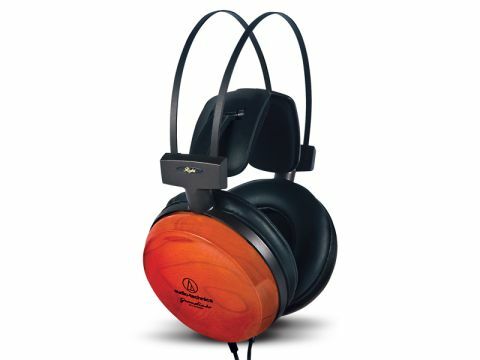 Among major headphone manufacturers, Audio-Technica produces one of the most inclusive ranges available, with something of a speciality in closed-back models. The considerations between open and closed headphones are not cut and dried, but obviously closed ones tend to give more isolation to and from the world: on the other hand open models often have the edge in tonal neutrality. So the question now is how AT's changes affect the sound – can, for example, the ATH-W1000X measure up to giants like the Sennheiser HD800? The most obvious feature of this headphone is the beautiful wooden earcup, made from American Cherry and polished to a high lustre. Audio-Technica suggests that they contribute beneficially to the sound, which may indeed be so, but one can't help feeling that their appeal is at least as much visual! Inside the cups are the drivers, which at 53mm are the same size as those in most other high-end headphones these days (there seems to be a 'size war' and 53mm is currently the magic number). But, of course, details are at least as important, including the high flux magnets and lightweight diaphragms, which allegedly extend frequency response to 42kHz. AT also mentions a 'floating mount system' (a compliant mounting, basically) which helps reduce internal structural resonances, plus a damper which helps reduce acoustical resonance. This is all useful stuff, as resonances (left unchecked) can bedevil headphones, just like speakers, making listening more of a headache than a pleasure. We must also mention AT's 'wing' support which is a very clever way of resting headphones on the head – this latest version is the most comfortable yet. As one tends to expect of expensive Japanese equipment, the finish on this headphone is somewhere between very good and superb. Not every detail is quite perfect, though, and we found the overall headband a bit disappointing – it's rough and awkward to the touch and also couples mechanical noise into the earcups rather too readily if it touches the back of a chair. On the other hand, the cable is much improved from the original ATH-W1000 and couples very little noise. The earpads are covered in very soft leather and feel great over the ears. Compared with other expensive headphones, the whole look and feel is right on the money. Having heard the original W1000, the general feeling is that the sound of its successor is on a par. Which, given the credentials of the former, can only be to the good. Bass is just terrific, with vast extension and real weight, plus plenty of attack and bite. Lower midrange is great too, but there is still some coloration in the upper midband and treble, which slightly emphasises background hiss, vocal sibilants and so on, as well as the odd very high melodic note. On the whole, though, we feel this has been reduced in the X version, while detail is slightly improved. As a result, it is now easier than ever to hear all the fine detail in familiar recordings and the mild tonal aberrations soon become second nature. If everything else is right, the ear is pretty tolerant of deviations from absolute response flatness. Overall, then, we are very impressed with this model. It plays cleanly up to very high levels (so go easy with that volume control! ), but also has great subtlety in quieter music. It combines truly excellent performance in the lower parts of the spectrum with good results higher up, but although it may take a little getting used to, its very good resolution is always appealing. It also proves comfortable over long listening sessions and the modest, but useful reduction in background noise is a genuine advantage, very often, over openback alternatives. All-in-all, it's a fine transducer.